The 5 winners of the call AquaBioTech Group, Flyby, Sinay and StatnMap were selected based on strict criteria, prioritizing the business growth potential for the blue sector all 5 winning companies belong to. The objective of the call is to empower 5 European SMEs working on collaborative data management for the fisheries, marine, environmental & ecological domains or in the aquaculture sector by providing them access to the BlueBRIDGE resources (datasets, services and technologies and data analytics). The support offered by BlueBRIDGE will help SMEs to solve data management issues, to improve their existing services or technologies and to enhance their portfolio through the development of new services. 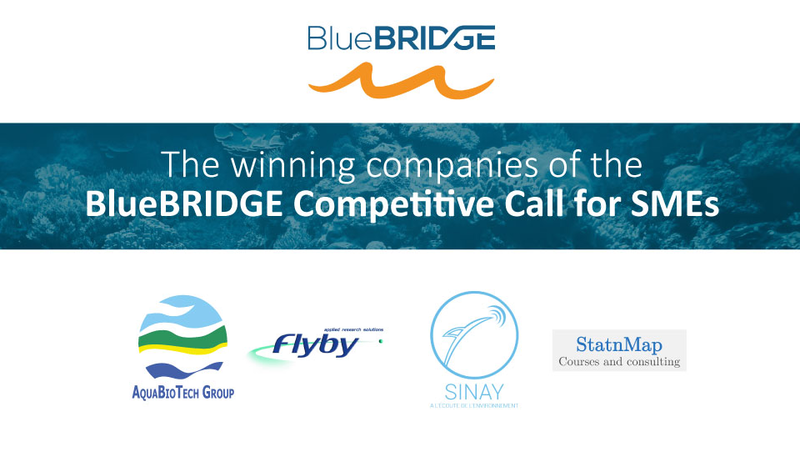 In June 2017, the BlueBRIDGE evaluation committee, composed by experts in computer science and in data management applied to ecosystem approach to fisheries and aquaculture, reviewed the applications received and selected the 5 winning companies.